The Spanish studio Masquespacio diseño démocratico designed the Visual Identity and the first store for Doctor Manzana, an online smartphone and tablet repair company which now wishes to establish a bricks-and-mortar presence. Architect Daniel Libeskind recently unveiled plans for a new housing development in Berlin. One of Bulgaria's biggest shopping centres has just opened in Sofia: a multifunctional centre that will bring new urban development to the Hladilnika district, near South Park. GranitiFiandre’s big ceramic surfaces cover the walkways and create unexpected chromatic effects. The Stuart Weitzman flagship store designed by Zaha Hadid and inaugurated by brand testimonial Kate Moss during Fashion Week in Milan is the first of five stores the architect is to design for the well-known footwear maker. Sweet interior design in Yokohama. The Papabubble sweet shop and artisanal confectioner in Yokohama, Japan, designed by Japanese studio Schemata Architects, is all about the visual interaction between the building materials and the goods on display. The Line Hotel, Los Angeles. A “fusion” project. 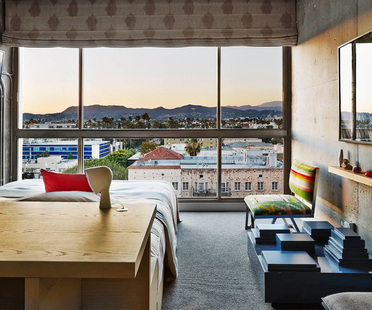 A building dating from the '60s in Los Angeles’ Koreatown has been converted into a hotel, a manifesto of the city’s “fusion” culture and a distillate of its essence.